East 17 is back and ready for stages with original members John Hendy and Terry Coldwell and newest addition to the line-up Robbie Craig. The group achieved 18 Top 20 singles and four Top 10 albums, and were one of the UK’s most popular boy bands during the early to mid-1990s, aided by strong tabloid interest in their ’bad boy’ image compared to the ’clean cut’ image of rivals Take That. Their style blended pop and rap in songs such as ”House of Love” and ”Let It Rain”. East 17 have currently sold a minimum of 1.8 million albums and 1.8 million singles in the UK alone. As of April 2012, the group have sold 18 million records worldwide. 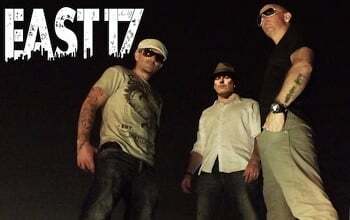 East 17 Bookings – Room 5 Agency. International artist booking agency Since 2005.